Housed at the Institute on Education and the Economy, the Community College Research Center conducts research on the major issues affecting community colleges in the United States and contributes to the development of practice and policy that expands access to higher education and promotes success for all students. Visit CCRC's website to learn more about the center's research, publications, news, and more. This report provides a thorough description of the Virtual Enterprises International (VE) high school program and includes student and teacher perceptions about the program. In this book, researchers at the Community College Research Center analyze how colleges have tried to improve their performance with respect to low-income students, students of color, and nontraditional students, given the challenges that their students face. While policymakers and educators hope to expand the availability of credit-based transition programs at community colleges for a broader range of high school students, few states have legislation that support outreach to low and middle achieving students. 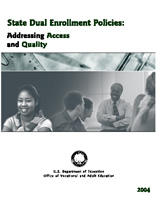 This report analyzes dual enrollment legislation in all 50 states and whether these polices promote or inhibit the spread of dual enrollment programs. Based on over five years of research on work-based learning in high school and community college programs across the country, Working Knowledge explores the potential for using work-based learning as part of a broad education reform strategy.